Taking their name from the legendary weapon of the Dune novels, you might expect something quite musically eccentric from brothers Tom (guitar) and Steve (keyboard) Campitelli. However, the reverse is true. 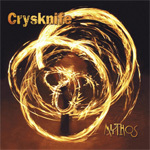 Mythos, their first full length work, is an accessible album of innovative progressive rock which is informed by styles both classic and modern. The Campitelli brothers find inspiration from Deep Purple to James Brown to Helmet to Paradise Lost. This results in compositions ranging from the old school 70's prog of Reanimate to the more modern metal feel of Concede. Little of this could be accomplished if the Campitelli's were not accomplished musicians. Steve Campitelli's classic piano training informs many arrangements, and Tom's fret work is both diverse and inventive as it is fundamentally sound. Ultimately, by combining a rich depth of musical styles with clever arrangements and skilled musicianship in Mythos, the Campitelli brothers have created a intriguing and entertaining of work of progressive rock. By combining a rich depth of musical styles with clever arrangements and skilled musicianship in Mythos, the Campitelli brothers have created a intriguing and entertaining of work of progressive rock.